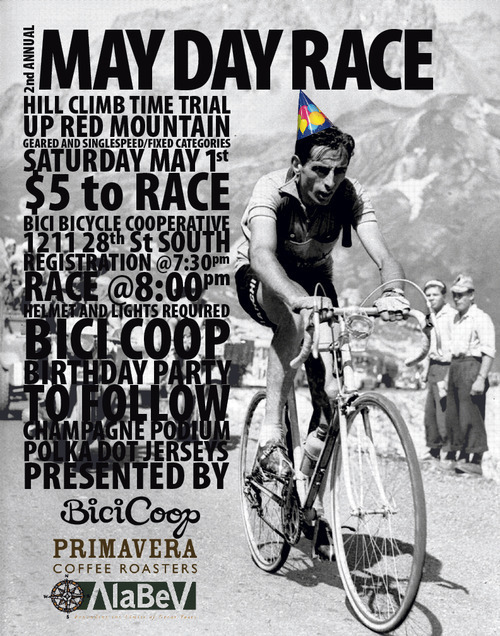 BikeSkirt » Blog Archive » 2nd Annual May Day Race TOMORROW!!! It’s our 1 year anniversary as a co-op, and this party is going to be epic. Keg of Sweetwater from Birmingham Beverage, espresso concoctions from Primavera Coffee, and baked goods from me! Congrats on your 1st birthday, Bici! Woo hoo! Hope we get to see some of the party pics! You’re so good about taking those and posting ‘em! Yours is one of our favorite cycling blog sites out there and we know we’re not alone. I honestly do mean this and if you haven’t heard about the Crank Honors yet, I’d like to have you drop by http://cranklisted.com and get all your fans to nominate you. You guys need to be in for the voting….you rock.